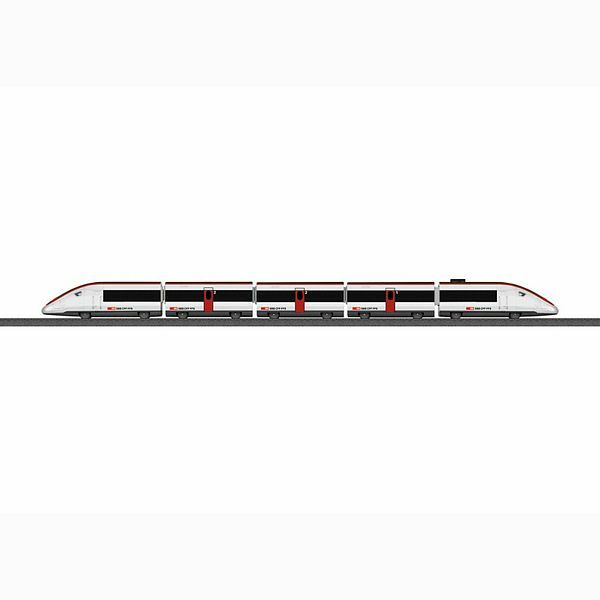 Prototype: Express train based on a Swiss high-speed train. Five-part train set. Model: Express train based on a Swiss high-speed train. Five-part train set. Model: The train has a battery-powered drive and magnetic couplers between the individual cars. There is also a permanently coupled unit consisting of a powered end car and a passenger car with a built-in battery holder. The train has 3 speed levels in both forward and reverse, 3 sound functions, and dual headlights. Train length 63 cm / 24-13/16“. Contents: The set has 12 sections of curved plastic track, 7 sections of straight plastic track (172 mm / 6-3/4”), 5 sections of straight plastic track (188 mm / 7-13/32“), 2 sections of curved plastic track (turnout curve), and 1 left turnout and 1 right turnout. 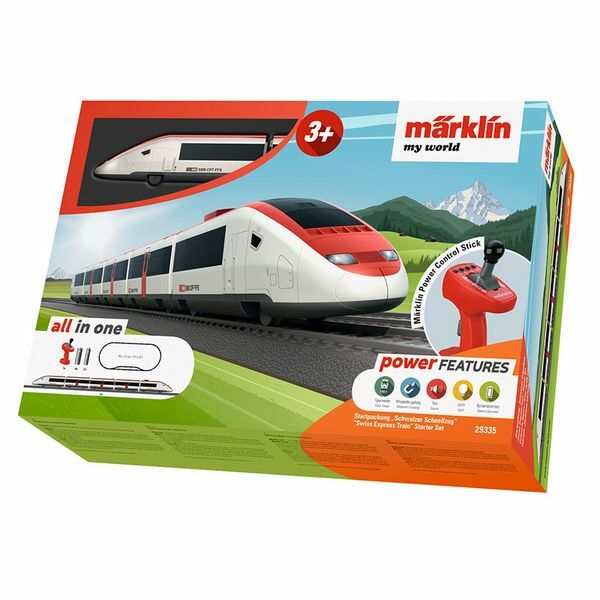 An easy-to-use wireless Märklin Power Control Stick as well as 4 x AA and 2 AAA batteries are included with this set. The train can be operated with 2 different frequencies thus allowing another battery-powered train to be operated with this set at the same time. This set can be expanded with the 23300 plastic track extension set.